Queen of Hearts slot game, brought to you by NovomaticCasino.co.uk is a fairy-tale slot in every sense. This Queen of Hearts is nothing like that evil one in Alice in Wonderland! No, this Queen of Hearts is nice and is on your side. It’s a very feminine slot, from the pink, purple and red colour scheme to the music and the symbols – you’ll soon see as you load it up that it’s one for the ladies. It’s extremely popular and that will come as no surprise when you find out just how lucrative and generous it can be. Packed with special features, this slot is not to be missed! Perfect for mid-level slots players, as well as fans of our other slots, such as: Cindereela, Mermaids Pearl, Lucky Lady’s Charm Deluxe and Magic Princess. 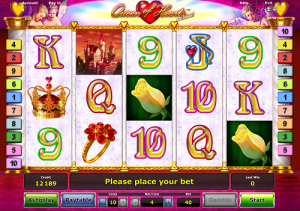 In Queen of Hearts slot game, the fairy-tale theme gives rise to some wonderfully romantic symbols. The lower-paying symbols are the card value symbols, from 9 to King, and these are all gold with colourful linings and the Jack even has a heart-shaped ruby on it! The higher-paying symbols include: a beautiful ruby ring, a golden crown, a yellow rose, a fairy-tale, princess castle, a red heart and the Queen of Hearts herself – who is a beautiful, blonde bombshell. To get a payout in Queen of Hearts slot game, you’ll need to spin two/three or more matching symbols on a winline, in consecutive reels from left to right. Your payouts will vary according to the symbol, the number of matching symbols and the size of your bet. You can have a look at how much you’ll win by looking at the paytable, and you can change your bet by using the plus and minus symbols to either side of your bet amount. The best thing about the Queen of Hearts slot game is the free games you can win! Whenever you spin three or more Queen of Hearts symbols, you’ll trigger a generous number of free games! More free games can be won during these free games and there’s also an extra special cupid feature too! After any spin during these free games, cupid might come along and add red heart symbols anywhere on the reels! The red heart symbols are extra special because they can substitute for any other symbol – which means that you’ll be in with a much better chance of getting lots of big wins! With cupid on your side, these free games can be very generous and lucrative indeed! In Queen of Hearts slot game, there are several standard features which players will be familiar with. Firstly, you can play the game for free until you’ve got to know the game. Then, once you’re ready to play for real you can! You can put the game into ‘autoplay’ once you know it really well and let the reels spin themselves for you. The only thing you won’t be able to do during autoplay (aside from changing your bet) is to gamble your wins! The gamble feature in Queen of Hearts slot game is a standard double-or-nothing gamble feature. Choose red or black, if the colour of the next card matches your choice, you’ll double your win! Aside from the Queen of Hearts slot game, NovomaticCasino.co.uk has plenty of others for you to choose from. Our myriad of games is never-ending! We also have table games, card games and live dealer games! Our live dealer games are ultra-realistic and authentic and allow you to play with real dealers at real tables! You can choose to play any of these live dealer games, whenever you like: Live Poker, Live Roulette, Live Blackjack and Live Baccarat.